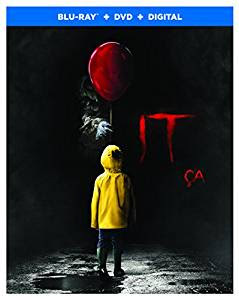 When children begin to disappear in the town of Derry, Maine, a group of young kids are faced with their biggest fears when they square off against an evil clown named Pennywise, whose history of murder and violence dates back for centuries. Based on Stephen King's book titled IT. You can now purchase IT online and in stores near you. I am a big fan of Stephen King books and movies/tv shows based on Stephen King books so of course, I couldn't wait to watch this new version of IT. On Saturday night my husband and I sat down to watch the movie and we both enjoyed it very much. I love that it takes place in the 80's. Of course there were some differences from the books but I personally think that this version was very well done. I do like the new Pennywise. I found he was way scarier looking and I like Bill Skarsgard as Pennywise. My only complaint was that I didn't find the movie really that scary but I still loved the movie anyway. I can't wait for the second part of IT to come out but we will have to wait until 2019.